This issue of The Orthodox Word is dedicated to the life and struggles of an uncompromising confessor of Orthodoxy who served the Church during the perilous first two decades after the Russian Revolution. Born in 1878, Bishop Victor became a monk at the age of twenty-five. He labored as a missionary and then as a monastic superior, until he was consecrated a bishop in 1919. From that time on he began to defend the Church against various threats, both from without and from within. For this he suffered imprisonments and exiles, yet he never lost his peace of soul and was a great encouragement and consolation to others. 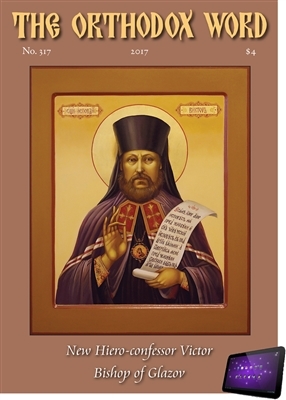 This life of St. Victor was compiled by Russia’s foremost martyrologist, Abbot Damascene (Orlovsky). This issue also includes The Orthodox Word Index for 2017.